More Maryland students are receiving their high school diplomas than ever before, according to data released last week by the Maryland State Department of Education. As the graduation rate has hit record levels, the dropout rate has declined. The four-year cohort graduation rate reached 86.39 percent in 2014 -- more than 4 percentage points better than the 81.97 percent rate registered in 2010. The graduation rate jumped more than 1 percent over 2013, from 84.97 percent. At the same time, dropout rates have fallen to new lows. Four-year cohort graduation rates for American Indian, African American, Asian, Hispanic, and White students improved between 2013 and 2014, as did the rate for students identifying as two or more races. The graduation rate for African American students has jumped from 76.09 in 2010 to 80.54 in 2014. Among students receiving special services, the four-year cohort graduation rate rose in two of three categories. The graduation rate for Special Education students, for example, improved more than 3 percentage points in one year, from 60.03 percent to 63.45 percent. The graduation rate for students receiving free- or reduced price meals increased by nearly two percentage points, from 75.81 percent to 77.75 percent. The graduation rate for English Language Learners (ELL) dipped from 57.3 percent to 54.1 percent. It should be noted that many ELL students spend an additional year in high school. The five-year cohort graduation rate for ELL students in 2013--the most recent year with complete figures--stood at 67.48 percent. Maryland five years ago moved to the cohort graduation rate, which follows a set group of students from freshman year through their senior year. The four-year cohort graduation rate has improved every year since. Simultaneously, the dropout rate has been in steady decline. The State’s dropout rate, which stood at 11.93 percent in 2010, dropped to 8.35 percent in 2014. The percentage of students dropping out of school also has declined across racial subgroups. The four-year cohort dropout rate for Hispanic students has declined from 18.65 percent in 2011 to 14.68 percent in 2014. The dropout rate for African American students fell from 14.6 percent in 2011 to 10.57 percent in 2014. 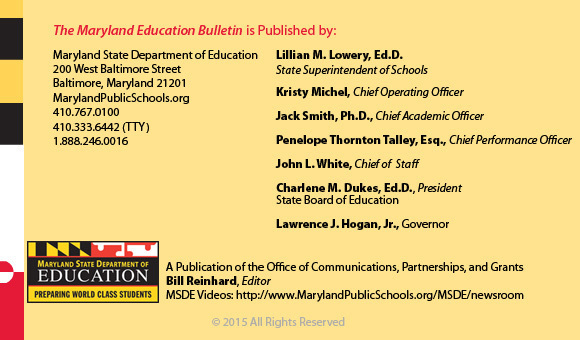 The new high school and system data is available on the updated MdReportCard.org. When teacher Maggie Hawk walked into the school assembly with her first grade class last Wednesday, she had no idea she was walking into her own party as the guest of honor. 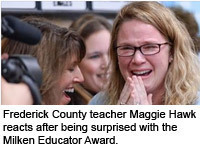 Minutes later, the Yellow Springs Elementary School teacher was shocked when, in the midst of students, teachers, staff and assembled dignitaries, she heard her name announced as the Maryland recipient of the prestigious Milken Educator Award, which comes with an unrestricted $25,000 cash prize. Milken Family Foundation Co-Founder Mike Milken, together with Maryland State Chief Academic Officer Jack Smith, delivered the news to the flabbergasted young teacher. Milken said Hawk embodies the qualities of a Milken Educator. Dr. Smith made the comment that Hawk is the quintessential elementary school teacher, using any means necessary to make certain her first graders thrive and succeed. As a first-grade teacher, Hawk has built an ideal learning environment by combining solid data, effective use of technology and a collaborative teaching approach combined with an unflagging work ethic and a commitment to connect with each student. Students with academic or behavioral difficulties routinely blossom in her class, and every student exceeds the high expectations set for them. Whether co-teaching with other specialists to meet student IEP needs or supporting students who already excel to greater heights, Hawk’s students consistently leave her class above grade-level in core subjects, confident and ready to learn more. Hawk is committed to using technology and the widest variety of traditional and innovative learning techniques to help each student deeply understand the material. Hailed as the “Oscars of Teaching” by Teacher Magazine, the Milken Award recognizes exemplary elementary and secondary school teachers, principals and specialists who are furthering excellence in education. The award comes with an unrestricted financial prize of $25,000 and alternates yearly between elementary and secondary educators. Along with the recognition typically bestowed to recipients, Hawk now belongs to a network of more than 2,600 K–12 teachers, principals and specialists from around the country. Past recipients have used their Awards to finance their children’s education or their own continuing education. Others have financed dream field trips, established scholarships and even funded the adoption of children. Maryland joined the Milken Educator Awards program in 1993. Since then, there have been 59 recipients in the state. Maryland schools next month will begin full implementation of the new Partnership for the Assessment of Readiness for College and Careers (PARCC) exams, and we are excited about the change to this cutting edge program. MSDE will be spending the next month putting a spotlight on the new assessments and encouraging our schools and students to #PrepareForPARCC. The new assessments replace the Maryland School Assessments in English and mathematics in grades 3-8, and replace the High School Assessments in Algebra I and English 10. Those tests have moved our State forward, but with new standards comes the time to take the next step. The new PARCC assessments are aligned to the Maryland College and Career-Ready Standards, developed from the Common Core and fully implemented during the 2013-14 school year. PARCC allows us to assess and measure higher-order skills such as critical thinking, communications, and problem solving. Three out of every four students will be taking these assessments online. PARCC is an advanced assessment that will assist educators in the classroom by providing instructional tools to support implementation of the new standards. We are excited about the information our educators and parents will receive from the assessments. Microsoft collaborated with MSDE on the project in response to President Obama’s ConnectED challenge. On February 4, 2014, President Obama visited Buck Lodge Middle School in Adelphi, MD to announce progress on the national ConnectED initiative to connect 99 percent of students to broadband Internet. Microsoft and other private-sector companies committed to deliver modern technologies to classrooms. Through this collaboration, young people and adults have access to the tools, skills and certification opportunities they need to train at school and at home for in-demand careers. Private-sector companies like Microsoft are helping to strengthen learning by increasing access to the technology and training needed to acquire skills for any professions that students choose to pursue. Microsoft will provide a one-year license for the Microsoft IT Academy program to 25 high schools in 10 county school systems, including High Point High School in Prince George’s county, where the announcement was made. All students in the receiving high schools will have access to online courses and tutorials, and teachers receive unlimited access to instructional tools. While many students currently use Microsoft applications as part of daily instruction, creating documents, or completing assignments, not all students receive instruction in the use of advanced applications or computing. The Microsoft IT Academy resources are designed to help students learn computing and advance their technical skills in a wide range of applications and receive industry-recognized certifications. ProPlus benefit at no additional cost. Every student and teacher at public schools across the State can download Microsoft Office on up to five PCs or Macs, and Office apps on any mobile device, enabling them to get their school work done virtually at any time and from anywhere. The following private and secure site has been developed by Planet Technologies, in collaboration with MSDE. Students and their families can download Office 365 ProPlus at the following Internet address: https://marylandaccess.education. 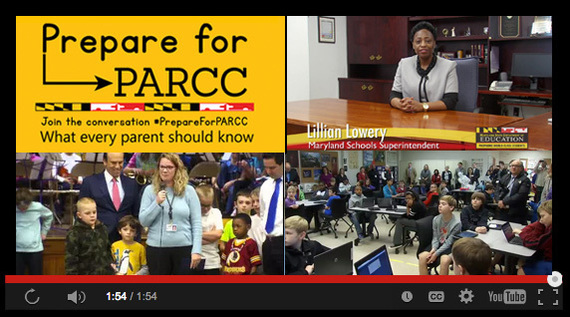 Maryland Schools Superintendent Lillian Lowery talks about the PARCC assessments that start in March. 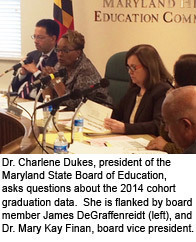 Her comments kick off Maryland's campaign to keep parents informed about PARCC. Maryland's 2014-15 Teachers of the Year are recognized and honored by lawmakers in Annapolis on Day 1 of the session. Maryland and Microsoft announced a partnership today that introduces 25 new IT Academy programs at Maryland schools. Students, teachers, and families will benefit -- more from High Point HS in Prince George's County.